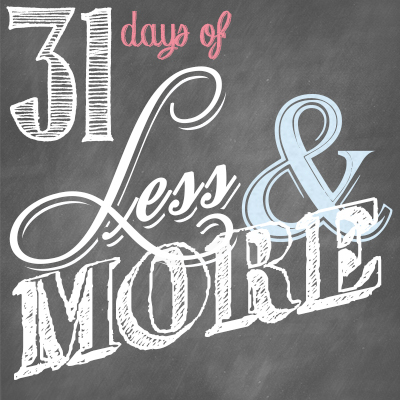 This is Day 18 of our 31 Days of Less & More challenge. To read all the posts in order, start with Day 1, then visit the Overview Page to see the entire series. I tried hard to get ahead before we left, but four weeks is a long time to be on the road. By the time we finally made it home from our 4,000 mile adventure–as wonderful as it was–I was both exhausted and completely overwhelmed. Suddenly I was behind on everything. Between the blog posts and email, unpacking and laundry, home maintenance and bills to pay, not to mention the start of a new school year, it felt like I would never, ever, ever catch up. I don’t know about you, but I can’t stand the feeling of flying by the seat of my pants. I much prefer checklists and game plans and a strategy to accomplish just a little each day towards my bigger goals. Even so, I find myself playing catch-up far more often than I would like, especially when Real Life gets in the way of my best-laid plans and overbooked schedule. Over the years, I’ve developed few strategies to both help me get caught up and to ease the stress when I get behind. Because let’s face it, needing to get caught up is often just a part of life. And although it can sometimes take a while–it took almost a month to feel like I had caught up after our big road trip–I’ve found that using these strategies diligently does eventually work! Next time you are feeling behind, you might want to try them too. Positive Self Talk. It almost sounds silly to say it out loud, but talking yourself off the ledge can help a lot. Remind yourself that whatever stress you are feeling is temporary. Sometimes we can get so overcome by the stress & emotion that we forget that whatever we are feeling right at that moment will not last forever. Keep telling yourself that this too shall pass, as many times as you need to. Write it Down. When you’ve got (what seems like) a million to-do’s floating around in your head, the stress and pressure of trying to keep track of it all can easily become overwhelming. The best thing to do is get it OUT of your head and onto a sheet of paper. This usually helpful for two reasons. First, you no longer have to worry about forgetting something, and second, the list on paper almost always looks much more manageable than the list in your head. Prioritize. If your list really is longer than what time will allow you to accomplish (and isn’t it always? ), it is time to start prioritizing. My favorite way to do this is a technique taken from the book, Eat That Frog: 21 Great Ways to Stop Procrastinating and Get More Done in Less Time. Next to your action items, mark whether that task is an “A” task (MUST be done), a “B” task (SHOULD be done), a “C” task (COULD be done), or a “D” task (DOESN’T NEED to be done, at least right now.) If you have more than one A task, give them numbers (A1, A2, etc. ), then begin tackling your to-do list in order of priority. Eat some frogs. Your frogs are your “A” tasks from above. Those things that MUST be done in order to actually catch up. You should always eat your ugliest, & hardest frog first, just to get it out of the way. It is amazing how much more manageable the rest of the list looks when you tackle the biggest frog first! Give yourself grace. No one can do it all and there will probably be things that don’t get done. Try to focus on the things that are most important–those A tasks–and give yourself a break on everything else. All you can do is all you can do! Be sure to read Edie’s corresponding post, More Planning. Are you feeling behind? Starting tonight, write down three things each evening that you want to accomplish tomorrow so your brain is ready to go as soon as you wake up. For the rest of the month, commit to waking up 15-30 minutes earlier than normal. Use that time to plan your day and to do 2 or 3 things to ensure that the rest of your day goes a little smoother. This could include getting a head start on breakfast, putting dinner in the Crock Pot, doing personal devotions, or eating a “frog” off your to-do list. Then, this coming Sunday, plan to give Edie’s Sunday Speed Prep a try and see if it doesn’t lead to a better week! Let us know what things you’ve done to catch up and plan ahead in the comments below or on Facebook. Bonus challenge: Read Eat That Frog! Be sure to also check out Crystal’s insights on Less Running Around/More Nesting! 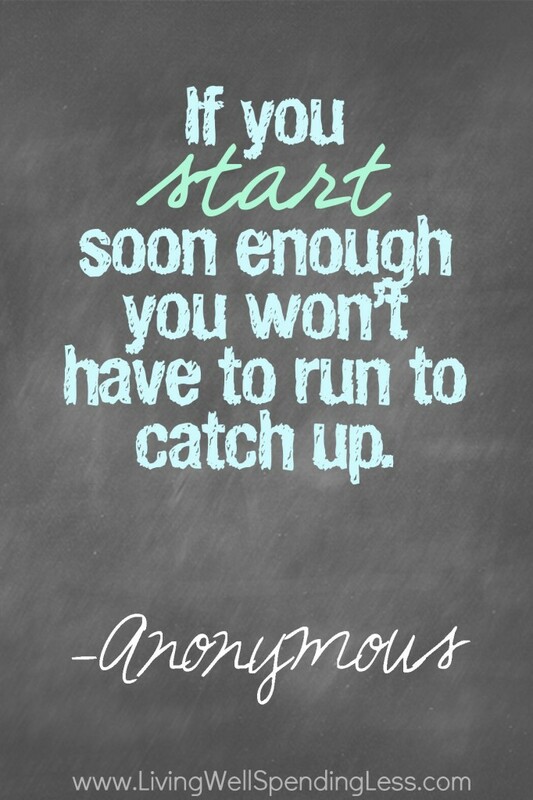 Do you ever find yourself playing catch-up? What helps you stay on track? I’m a list maker, so helpful, I love crossing off completed items! Prioritizing is important although sometimes it’s difficult when you’d rather complete other things first, I need to remember to tackle my biggest frog first!